I'm happy to inform you that your child has access to hundreds of eBooks using the subscription to www.raz-kids.com. Children can read and listen to books on Raz-Kids and even record themselves reading. They can later take a quiz to check for comprehension. As part of your Reading Log Homework, I have assigned every student in my class to read, listen, and take a comprehension test EVERYDAY as part of your 30 minute Reading Homework. When I log into my account, I can check if you are reading or not. pre-adolescents. 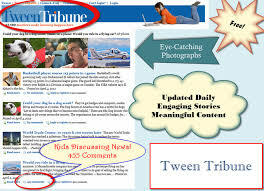 Tweens can post comments to the stories. Remember that I have to approve your comment before everyone else can see it. Make sure to begin your sentences with capital letters, use correct grammar, and correct punctuation. Attention All Students! Read up-to-the-minute news from around the world and get connected! - Choose your grade-level text for reading level that is just right for you! * Log in with your username & password and enjoy reading and writing! (Hint: Username is your first name, first letter of your last name and c23; password is your lunch number) **First letter of your first and last name MUST be capitalized! ***Read at least one article every week and make sure to post a comment. Newsela is an innovative way to build reading comprehension with nonfiction that's always relevant: daily news. It's easy and amazing! Newsela is free for students to explore a world of nonfiction and test their comprehension. Updated daily with real-world news from major publications, students can participate in conversation about the most urgent topics of our time, all while becoming stronger readers. Newsela makes it easy for an entire class to read the same content, but at a level that’s just right for each student. Log in with your username & password. (Hint: Username is your first name, first letter of your last name and c; password is your lunch number) **First letter of your first and last name MUST be capitalized!